Takom are bolstering their line of First World War releases with two new kits of the Mk.I, the first operational tank to be used in combat. The machine gun equipped, Female version will be issued in a separate boxing, but here we've got the 6 pounder armed Male, so let’s take a closer look. After the war on the western front descended into trench bound stalemate, the British Army realised they'd need some way of breaking through the enemy lines and opening gaps for the infantry. The Landships Committee was set up in 1915 to find a solution and, after tests with the prototype 'Little Willie', the first production Mk.I's made it to the front lines in time for the Somme Offensive in September 1916. 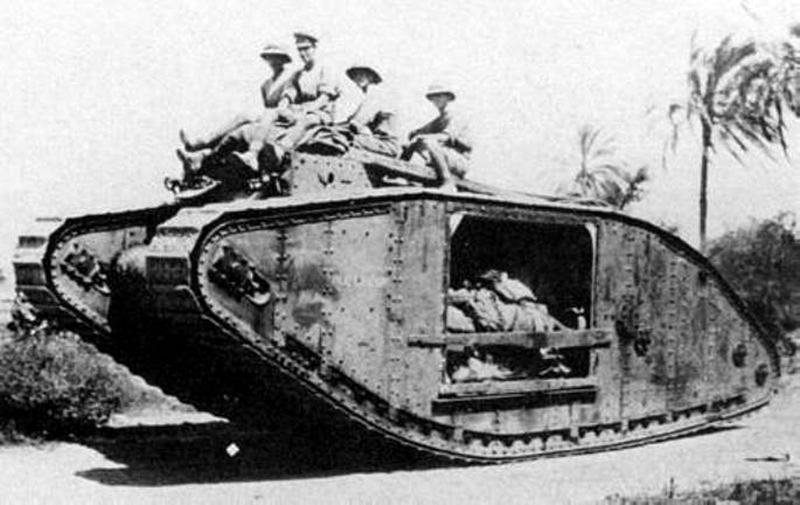 During it's development, it acquired the name “Tank” as a security measure to hide its true purpose. 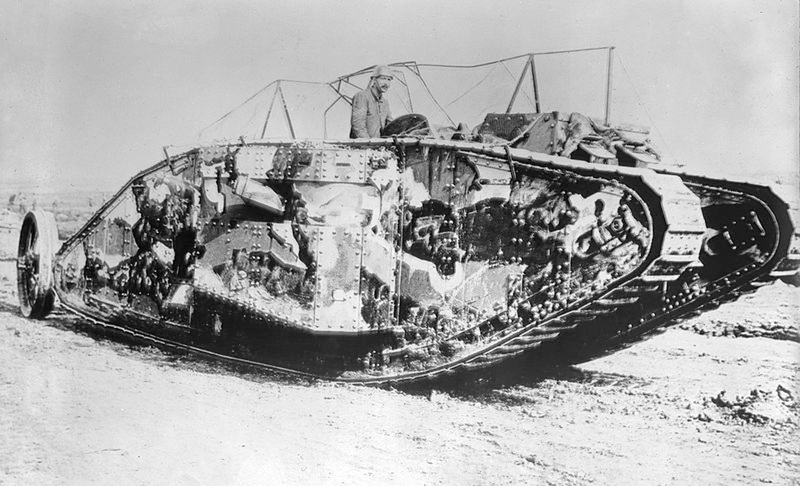 The Mk.I's had a fairly short operational life before they were replaced by the Mk.IV's which, although visually similar, incorporated several design improvements which made them a more effective weapon on the battlefield. The kit comes in a reasonably large box and, on opening it, you're certainly not going to feel short changed as it's packed with parts. In total there's 17 sprues in a medium grey styrene, several of which are common with the previously released Mk.IV's and the Whippet. In addition to the main sprues, the box contains a bag of clickable track links, a small sheet of PE brass, two lengths of brass chain, six poly caps and finally a tiny decal sheet. You also get the usual landscape format instruction manual and a full colour marking guide, once again prepared by AMMO by Mig Jimenez. These are the standard running gear sprues that appears in all of Takom's previous rhomboid tank kits. The parts are nicely detailed as far as they go, but it'll all be hidden once the tracks are in place so it's best not to spend too much time on clean-up here. Just glue the wheels in place and move on to the next step. Almost half of the parts on these sprues will be unused on the Mk.I. The sprockets, drive chains and track grousers are all surplus to requirements although I suspect the four unused Lewis machine guns will be popular spares. This contains various hull plates, some of which, including the entire upper hull, are unused as they're leftovers from the Mk.IV release. More food for the spares box, or maybe they could be used for a workshop diorama? Here we've got the main inner and outer track frames. 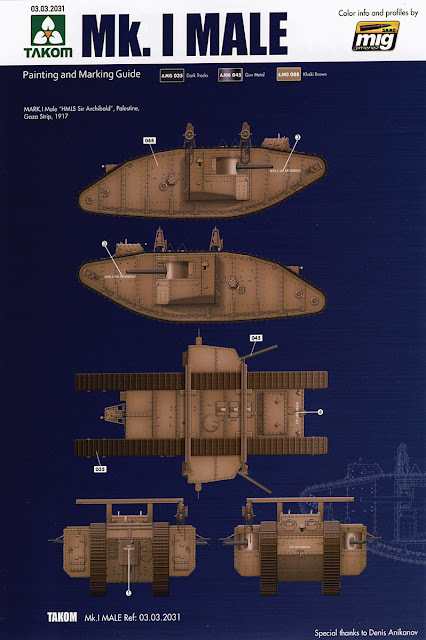 These are broadly similar, although not identical, to those for the Mk.IV. These are essentially the most prominent parts of the finished kit so it's good to see the detail is very cleanly moulded. These are the plates that make up the sponsons. The main plates here all have bevelled edges so a little care will be necessary when lining everything up, although if Takoms previous releases are anything to go by, the fit should be fine. The smallest sprue in the box with just four parts. These are the inner walls for the track frames, sitting directly behind the sponsons. This sprue has the new Mk.I upper hull plates that replace the ones on sprue D, together with the parts for the steering tail. Small details for the hull and steering tail. There are a couple of parts (T13 & 14) that, going by the box top illustration, are headlights, but they've been moulded solid and will either require some careful painting to simulate glass or hollowing out and a clear lens fitting. These are the main parts for the sponson trolley, which is essentially the bonus feature with the Male release (the Female comes with a grenade screen as a bonus extra). The wooden bed for the trailer has a very fine wood grain pattern embossed on the surface. It's too fine to be seen in the photo and could do with enhancing slightly, although this is preferable to an over done texture. There's also a couple of wooden stowage boxes that mount on the front of the trolley. These are plain and have no grain texture and also have four large ejector pin marks inside which will need filling. These have the drive sprockets which are used instead of those on sprue C and some very nicely detailed mounting springs for the steering tail. You also get four .303 Hotchkiss machine guns, one of which will be spare. 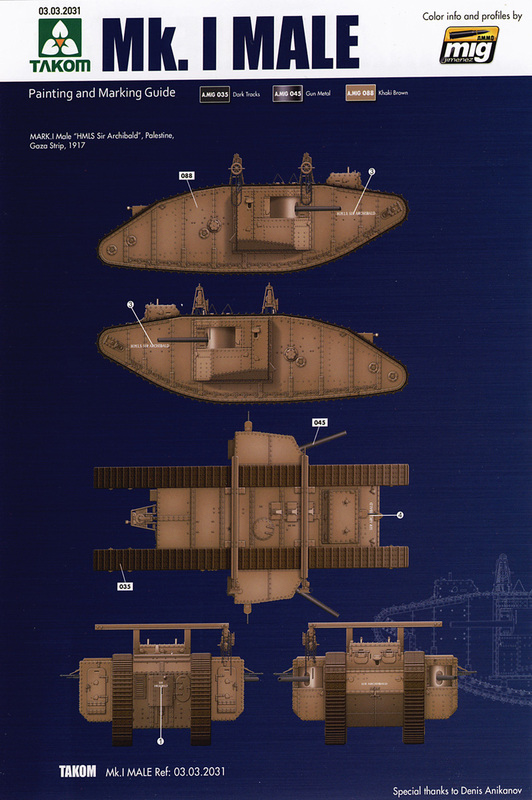 These are the parts for the main 6 pounder guns. There's some nice breech detail should you wish to leave one of the sponsons separate to display on the trolley as the box top suggests but, since there's no interior included for the main hull, it's probably best to leave the sponsons in place. Sadly, the turned metal barrels that came with the Mk.IV are absent here, but the styrene alternatives are single piece mouldings with a hollow barrel. The last two sprues contain the two part wheels for the trolley and the frames for the sponson crane. The tracks are the same clickable indi-links from the earlier releases. They are already separate from the sprue and only need a small moulding pip removing, which only takes a quick swipe with a sanding stick. Assembly is a breeze and they can then be painted separately and added at the end of the build. The small PE fret supplies some brackets for the upper hull and the sponson trolley, and the ammunition stowage rack. 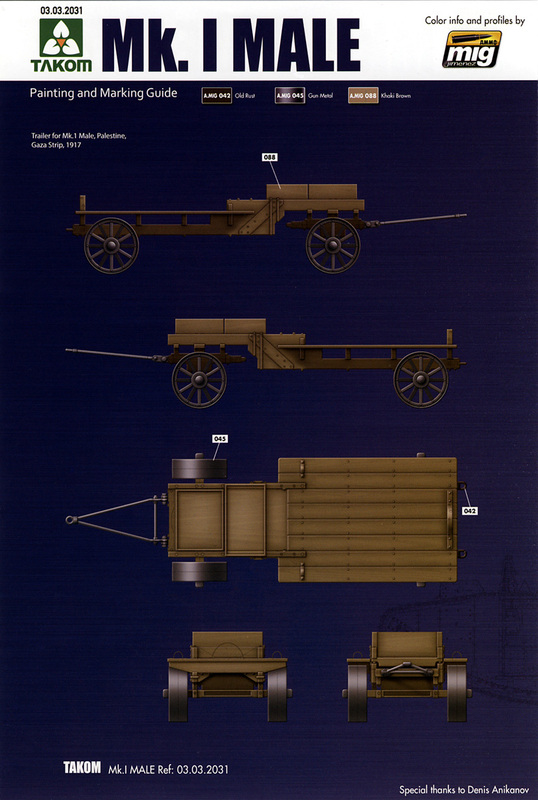 The two lengths of brass chain are added to the sponson crane and the poly-caps are used for the gun mounts and the wheels on the trolley and steering tail. AMMO have provided three marking options with the kit, which is about as much as you could hope for as these tanks didn't feature much variety in their finishes. You get two examples from the Somme in 1916, both finished in the early Solomon camo scheme. 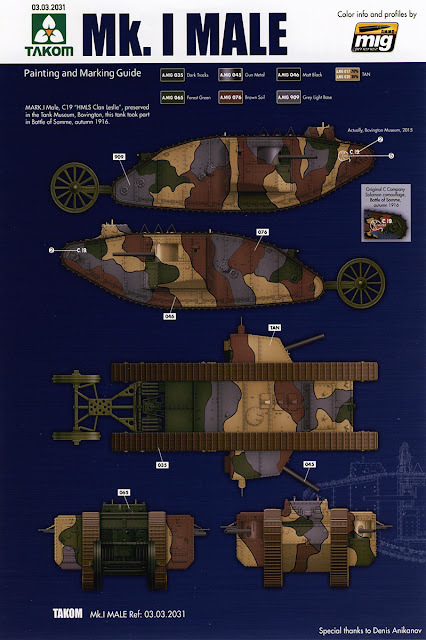 Interestingly, one of these, HMLS Clan Leslie, is preserved at the Tank Museum at Bovington and is shown in the camo scheme that it's displayed in, while a small boxed out section of the colour guide shows a slightly different scheme that it wore in 1916. 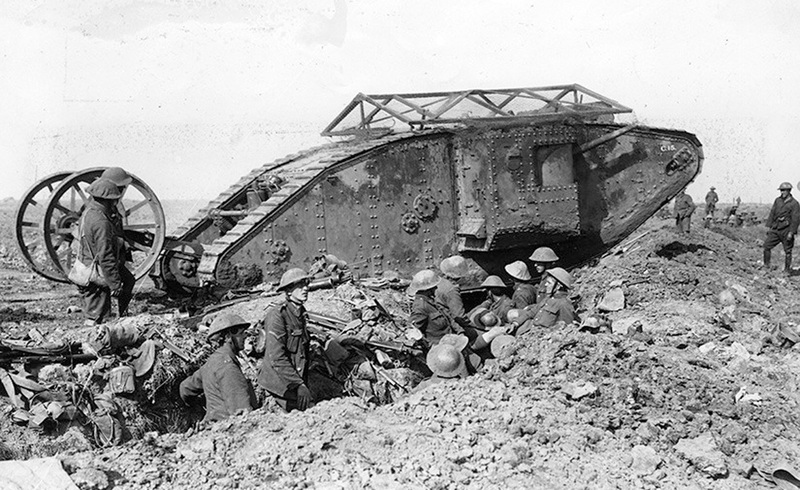 Unfortunately, only the front corner of the tank is illustrated in the alternative scheme making it very difficult to paint that version. The third marking option is for the Mk. I “HMLS Sir Archibald” in the Gaza Strip in 1917. This is the example that features the sponson crane. This is a significant and welcome release by Takom. The Mk.I was the world’s first operational tank and a good quality kit has been sorely lacking until now and this release, along with the Female boxing, plugs that hole in the market. 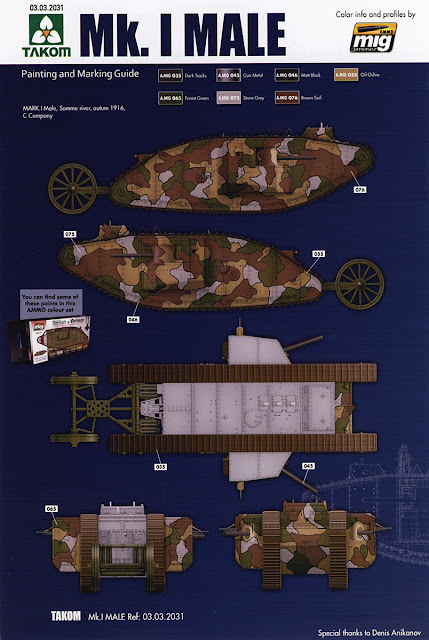 The added bonus features, in the shape of the sponson crane and trolley with the Male and the grenade screen with the Female, make these kits even more tempting, although I would have liked to see the grenade screen included with the Male release too. Highly recommended.